There are two main aspects of weatherization: air sealing and insulation. Air sealing means making sure that your home doesn't have leaks. All but the tightest of homes let far more air than necessary move in and out. In winter, the inside air (that you have spent lots of money warming up) moves out, while cold outside air moves in. In summer, it's the hot, humid outdoor air moving in while cooler indoor air moves out. 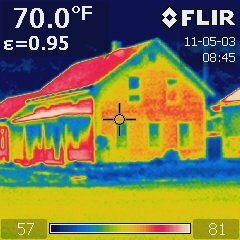 Sealing air leaks is the first priority in weatherization because a house with all the insulation in the world will still waste energy and be uncomfortable if cold winter air can move in right past the insulation through leaks. Air leaks also contribute to moisture problems that can lead to mold or rot. Once leaks are gotten under control, insulation can do its job in keeping indoor temperatures stable at a comfortable level. and doing the right thing for the environment.